Grid 2 Sets "The Most Expensive Preorder Yet"
So looking around on Facebook I came across a like suggestion that I happen to go and like. Basically I couldn't believe my eyes when I read if you Preorder this game you get a real life race car! I was like sign me the f*** up now!. Then I kept reading through the article come to see that the preorder cost around $190,000. I said yeah let me just pull that out of my pocket. The collector's edition of Grid 2, the Mono Edition, will be $190,000 and will include a real car. There's only going to be one and it's going to be for PlayStation 3. If you have an Xbox 360 and want this edition, don't worry – the Mono Edition comes with a PlayStation 3. Along with a a 170mph BAC Mono supercar, a copy of Grid 2, and PlayStation 3, you will also get a tour of the BAC factory, a racing suit, gloves, a helmet, and boots. European citizens can head here to pre-order the Mono Edition, but if you live in North America you will have to send an e-mail to sale [at] bac-mono.com and convince them to ship the vehicle overseas. Unfortunately, the Mono Edition will not include any additional pre-order DLC. For more on Grid 2, head here to check out our extensive preview. Head to page two to see the full press release. Los Angeles – May 24, 2013 – Today Codemasters® announced that the world’s most expensive videogame – the GRID 2™: Mono Edition - is available for pre-order with a price tag of $190,000 (£125,000). This exclusive edition of the game is available for just one customer and includes the highly anticipated racing game GRID 2, a PlayStation® 3 to play it on, a 170mph. 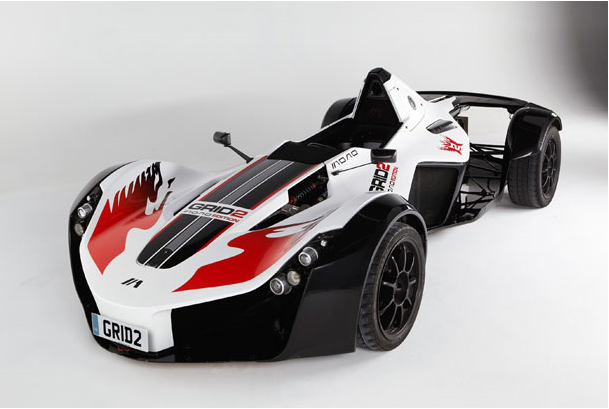 BAC Mono supercar - sporting a GRID 2 livery - and full driver race wear. The BAC Mono is a British manufactured, road-legal, ultra-high performance supercar which stars in the game. Created from high-strength carbon fiber, the BAC Mono is an unrivalled example of light-weight performance engineering and its 2.3 liter, 280 bhp four cylinder power plant will propel its driver from 0-60 m.p.h. in just 2.8 seconds. The GRID 2: Mono Edition is available to pre-order at www.game.co.uk/en/grid-2-bac-mono-edition-228776, and non-UK customers can contact [email protected] to register their interest. The game’s record-breaking achievement has been shortlisted for entry into the next Guinness World Records Gamer’s Edition. GRID 2 is the long-awaited sequel to the BAFTA-award winning, critically acclaimed GRID™ and will invite players race only the world’s most exciting racing cars on city streets, licensed circuits and open-roads. From Paris to Dubai and Barcelona to California, gamers will journey from rookie to racing superstar as they blaze to the top of World Series Racing, a new world of professional motorsport. While the GRID 2™: Mono Edition is a one-off, the standard edition of GRID 2 will race into retail next Tuesday, May 28. Fans can keep up with all the latest updates straight from the studio by speeding over towww.gridgame.com and www.facebook.com/gridgame or follow the team at www.twitter.com/gridgame. So now I'm like guess I'm going to go preorder the regular edition because I don't have that kind of money. Thought it was a very neat article that you can find here. Also a little about the game. In the game, players will compete in World Series Racing, the new competition founded by fictional entrepreneur Patrick Callahan, where drivers from different disciplines compete against each other across a range of events to find the ultimate racer. To get the series off the ground and attract attention from the world’s media, players must compete against and recruit the best drivers from the best racing clubs from different disciplines across the world, including Track racers, Drift specialists, Street racers and more.